Laura joined the Foundation in August 2016. As program associate, Laura assists with the administration of the Foundation's various grant and program-related activities. 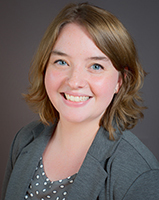 Laura, a lifelong resident of Naperville, graduated from Knox College in June 2015 with a bachelor's degree in Environmental Studies and minors in Economics and Business & Management. She also studied abroad in Copenhagen, Denmark. After college, Laura dedicated a year to national service as an AmeriCorps VISTA at Northern Illinois Food Bank. As a Community Engagement VISTA she worked on fundraising, donor relations, and community outreach.